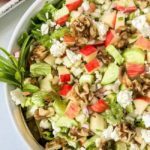 Up your salad game with this tasty Fennel Apple Chopped Salad with Walnuts and Feta Cheese. Full of Mediterranean flavours, this makes a crunchy side salad. Plan to make extra for brown bag lunches! In a colander set over a bowl, sprinkle salt over diced cucumber. Let stand and drain for 15 minutes. In a large bowl, whisk the oil and vinegar together. Add the drained cucumber, fennel, apples, onion and tarragon. Toss and let stand for 5 - 10 minutes. Add the romaine and toasted walnuts to the bowl, toss and season with sea salt and pepper. Top with crumbled feta or goat cheese and serve.